The next door neighbors go to church with one of Squishy’s school mates, and this afternoon the house was full ok kids. I had to bribe him to eat his dinner, and the price was an audience. Then the audience decided that dinner smelled yummy, and they wanted some! It was very cute. 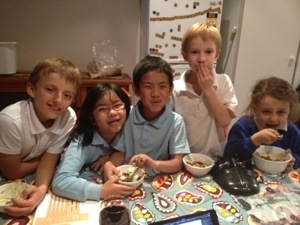 Five kids eating curry, and loving it!